Moringa Extract is a natural tincture using a special process of taking the potent nutrients from the moringa leaf and making it into liquid form. Moringa leaf extract is easy to use resulting in an increase in general well-being. What does Moringa Extract do? Take 1 to 15 drops a day in any drink of your choice. Your body may detox too fast (runny tummy, etc.) so it is recommended that you start on a smaller amount, and listen to your body. Our moringa leaf extract has the benefits of all the high nutritional potency of the Moringa leaf in a bottle. It is a concentrated form of Moringa. The main benefit of moringa extract is to assist those that are very very ill and who cannot take or swollow solids, only liquid. The extract is perfect for those that are, or have been ill and need to build up their body's strength and energy. Due to the unusually high quantities of nutrients in the moringa leaf, the moringa extract (of which is made from the leaf) produces astounding results. The moringa extract is very beneficial for people who are constantly on the go (like sports or business people, etc.) who need a quick energy boost. 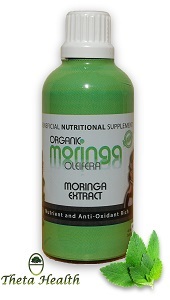 Using this extract helps to get moringa into the body's system easily and fast to give instant energy. Another moringa extract benefit, among many, is in the lowering of cholesterol with therapeutic potential for the prevention of cardiovascular disease. Our moringa extract is the perfect health remedy in a bottle, made from the cultivated organic leaves of moringa, grown in rural areas away from harmful toxic and polluted areas.